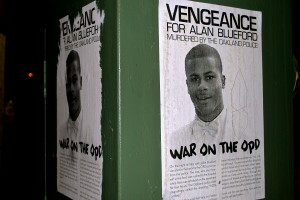 Increasing anger and frustration displayed on posters calling for “war on the OPD.” E. Cervantes, Oakland Voices 2012. 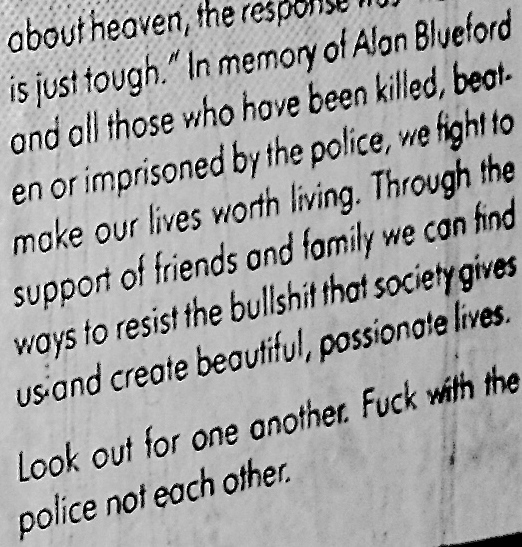 Recently, posters were plastered on an electrical box in front of the liquor store at 5th and Foothill that demanded “vengeance for Alan Blueford” and called for a “war on the OPD.” The sentiment struck me as a bit severe, frightening even. Regardless of what may have happened on May 6th, inciting further violence seemed counterproductive. And vengeance isn’t justice. 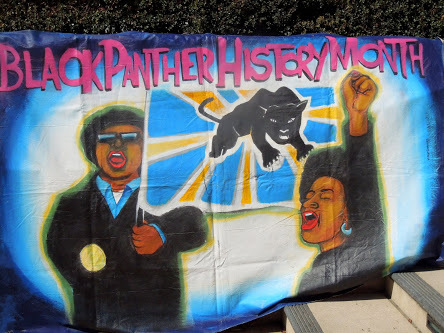 Banner displayed at the October 12, 2012 celebration of Black Panther Party History Month at Frank Ogawa Plaza in Downtown Oakland. Howard Dykoff, Oakland Voices 2012. The day after first seeing the poster, I attended a rally celebrating the 46th anniversary of the founding of the Black Panther Party here in Oakland. As part of Black Panther Party History Month in October, former members of the controversial political organization gathered at Frank Ogawa Plaza for speeches, awards, and performances that highlighted the Panthers’ good work in this city and other communities around the country. The event later moved down the street to Geoffrey’s Inner Circle for a meet and greet with influential early members and recognition of current volunteers who carry on the Panthers’ legacy of promoting economic and social justice. I couldn’t stop thinking about the poster and I wondered if, with the passing of time, members of the Black Panther Party had changed their views on guns and violence. I pulled up a picture of the poster on my phone and showed it to a former member, assuming he would tell me that the Black Panther Party wouldn’t condone violence these days. My ignorance of Panther politics must have been immediately apparent. He got silent, leaned back in his chair, and like a frustrated professor, sent me away to do further research. I was instructed to look into Robert F. Williams’ Negroes With Guns. After that, I could contact him if I still had questions. Leaning toward the more radical end of liberal politics, I’ve always assumed support for the Black Panthers. But in doing the suggested research, I realized that I had a one-dimensional understanding of the Party’s politics and ideology. It could just be a blind spot in my knowledge. Or maybe it would have been different had I not grown up in a mostly-white suburb. But I see it now: the Panthers have a complicated history that has been mischaracterized and unfairly stigmatized. “Black Panthers” for many conjures images of armed Black militants. At best, the Black Power Movement invokes Tommie Smith and John Carlos – the two Olympic medalists who were banned for life from the games after raising their fists during their medal ceremony in 1968. 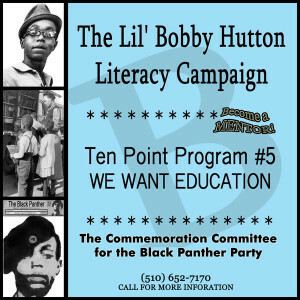 I did not associate the Black Panthers with projects like the Lil’ Bobby Hutton Literacy Campaign. Named after the Party’s first recruit – a 16-year old who was later shot to death by Oakland Police. The campaign is entirely volunteer-run and aims to cut Oakland’s high illiteracy rate. 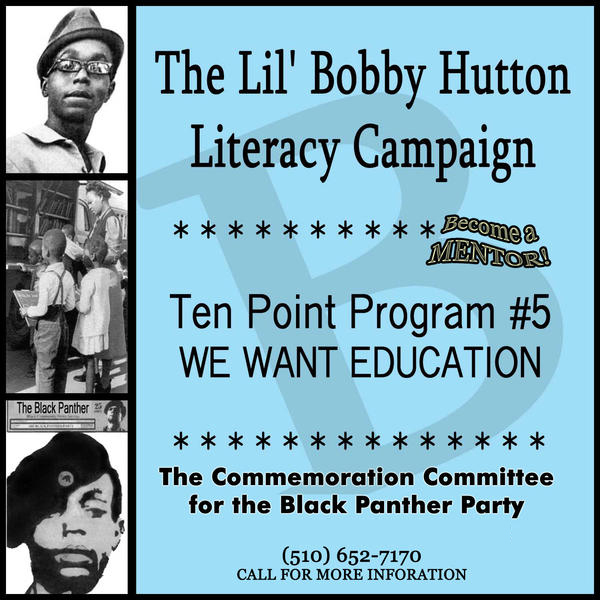 Addressing #5 of the Ten Point Plan, the Lil’ Bobby Hutton Literacy Campaign is always in need of more volunteers. CCBBP 2012. Coordinated by Eseibio Halliday and Melvin Dickson, the campaign struggles to secure grants for its work because funders are wary of its association with the Black Panthers. But they do what they can, where they can. Halliday, a young rapper who’s soft spoken in person, performed for the crowd at the Frank Ogawa Plaza rally. He was later recognized for his dedication to the 5th point of the Panthers’ Ten Point Program – quality, culturally-sensitive, historically-accurate education for the Black community and all oppressed people. Dickson was an early member of the Panthers and long-time editor of The Commemorator – a publication of the Commemoration Committee for the Black Panther Party. He also ran the Party’s free breakfast program in Oakland during the 1970’s. The Free Breakfast for School Children Program was perhaps the Panthers’ most successful and influential initiatives. But like the literacy campaign, their efforts to address hunger go largely unnoticed. Still, Auntie Francis, an early Panther and caterer for the event at Geoffrey’s, continues to fight hunger and runs the Love Mission Self-Help Hunger Program here in Oakland. Francis has used her own resources to launch the program but is pleased with the way her neighborhood has started to rally around the effort. Neighbors offer a few dollars, donate a casserole, or share their time in order to feed the hungry in their own communities. So what would the Panthers think about the call for “war on the OPD?” The group’s original full name points to an answer: The Black Panther Party for Self Defense. In Negroes with Guns, Robert F. Williams – who heavily influenced the Party’s founders – did not incite unnecessary violence. He believed that Black communities should protect themselves from violent racism “by any means necessary.” In this vein, the Panthers organized “police patrols” to monitor OPD’s behavior in black neighborhoods. The model was replicated in cities and town around the US. 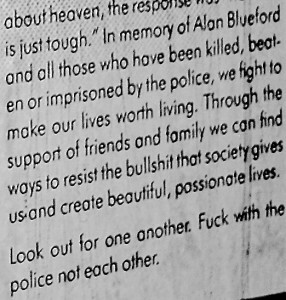 The poster’s smaller text reveals the desire to overcome racist obstacles, for “lives worth living.” E. Cervantes, Oakland Voices 2012. 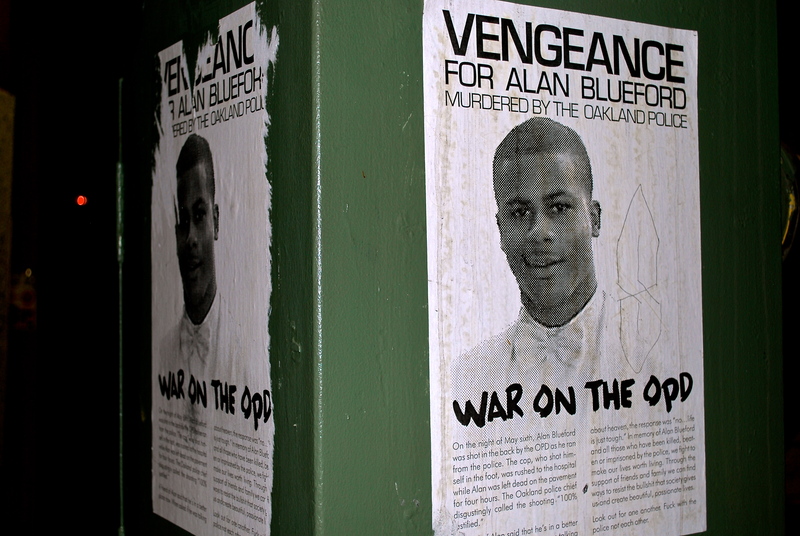 The posters may seem extreme and out of line, but considering the OPD’s well-publicized use of excessive force, perhaps the anger is justified. A closer look at the poster reveals a call for the creation of “beautiful, passionate lives” through support of friends and family. More than a call for war, it’s a call for community. “Look out for one another,” it goes on to read. Maybe the Panther spirit is alive and well in Oakland. Click here for more pictures of the Black Panther Party’s 46th Anniversary event. A native Angeleno and former New Yorker, Edward Cervantes is proud to now be a resident of Oakland, where he lives with his partner Jim and their three cats. He is a candidate for a master’s degree in public policy at Mills College. Fascinated by Oakland’s history, diversity, and geography, Edward looks forward to further exploring and writing about the city’s richness and complexity.